Yesterday after visiting the doctors, with the thought of a whole afternoon and evening free to myself whilst Jody was out sledging with her cousin, I decided to nip into Asda and have a mooch around the book aisle. I wanted to curl up in the living room for the afternoon with a cup of tea and something good to read. Although I normally gravitate towards memoirs or wartime fiction, I headed towards this book straight away. I kept picking up other books while this was in my hand, and put them back every time. For a while it was a tough choice between this and Shadows of the Workhouse by Jennifer Worth, but something told me to go with my instinct and read this book instead, and I'm glad I trusted it! I got home at 4pm, kicked off my shoes, put the kettle on and sat down with the book and a Belgian bun - which ended up being much needed sustenance in the end, as I didn't stop reading until 10:39. Yep, 6 hours and 39 minutes later, I had migrated to my bed and was still eagerly turning the pages while Jody was trying to get to sleep. The only reason I put it down was because Jody was blathering on about turning the light off. I even woke up early this morning so that I could catch an extra 45 minutes reading time before getting ready for work! Let me tell you, this book is a must read. The story line centres around Rachel and Ben, who met while studying English at Manchester University. It follows Rachel throughout the twists and turns of adult life, and explores the many feelings that come rushing back when she bumps into a married Ben, ten years later. Packed with wit and humour, each situation that Rachel is put in had me chuckling away- annoying colleagues, social faux pas- all mixed with one liners and the occasional awkward moment. Far from being the 'heroine' of the book, Rachel seems to be completely relatable to someone like me- she has flaws, and makes wrong decisions- but that's what makes her all the more real. Mhairi McFarlane is a true gem of an author. Each page had me nodding furiously along, rolling my eyes, cracking a smile and even shedding a little tear; sometimes even a mixture of all four. McFarlane expertly changes the mood of an entire page with a simple poignant phrase that takes you from stifling a giggle to wiping tears from your eyes in 0.2 seconds; no mean feat I'll have you know. Her ability to convey the many faces and depths of human feeling just through the written word is so impressive to me. The way that empathy is evoked page after page- it's like a roller coaster of emotions. This book is so much more than 'Chick-Lit'. It's independence, it's learning to stand on your own two feet, it's blossoming from a child to a woman, it's finding the courage to break out against settling for less than you deserve, it's irrevocable love and the all consuming heart ache it can bring. It's about every day life continuing around you when you just want the world to stop so you can get off. It's so real life you could forget that it actually isn't your own life (or maybe I just get really attached to fictional characters?) Speaking of characters, the ones in 'You had me at hello' stay so consistent throughout, I felt like they were my friends. There's at least one person in this book that will remind you of someone you know in real life! I'm so upset to have finished the book, I can't explain how sad I am! I wish the book was never ending! That's how I judge a good book apart from others- how much it calls to me to read it when I should be doing other things, and how sad I am when I finish! I thoroughly recommend this book to anyone- it doesn't matter if it's not normally your cup of tea. I'm sure you'll love it! 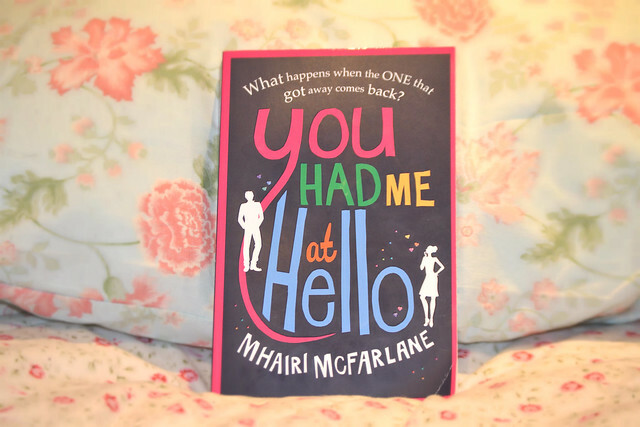 I've also been talking to/harassing the author on twitter (@mhairimcf) and she's super nice. 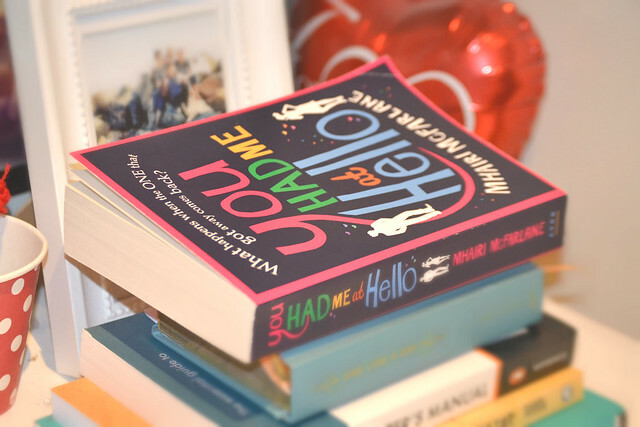 She's told me 'You had me at hello' may soon be turned into a film- you'll have to read the book before it does so that you can compare the two when you go see it! Now that I'm lonely and pining for another alternate world to bury my head in, please feel free to suggest some good books for me to read, or if you've read this book, let me know your thoughts! My friend and I were charity shopping and she picked this up yesterday - I was intrigued then and I'm now super interested having read your review! :-) I also enjoy for historical/war-time fiction; adored The Camomile Lawn, The Guernsey Literary and Potato Peel Pie Society etc - but it's always good to find something new to sink my teeth into!